You’ve just found out you have Periodontal Disease. Now What? Don’t worry! The most important thing is knowing about your condition and having a knowledgeable and experienced dental team to get your gums back to optimal health! The Advanced Dental Care team in Costa Mesa, CA has the solutions for you! Periodontal Disease is an active bacterial infection of the gum tissue in our mouth. Once bacteria has burrowed in between our gum tissue and teeth it begins to flourish. This bacteria inflames our gums and eats away at the bone holding our teeth in place. No good! Left untreated, periodontal disease can lead to more systemic inflammation, infections, and eventual tooth loss. At Advanced Dental Care, we provide same day diagnosis and treatment of Periodontal Disease. This may include a combination of Scaling and Root Planing (SRP), Laser Bacterial Reduction (LBR), and Oral Irrigation. You may have not heard of Scaling and Root Planing (SRP), sometimes called a “deep cleaning”. You are not alone! RDH Misty Rey answers all of your questions about Scaling and Root Planing. What does it mean to need a deep cleaning? 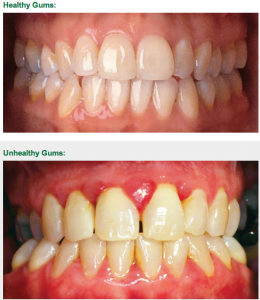 In a healthy mouth, gums are tight and firm. At your dental hygiene visits, we perform Periodontal Probing and Charting to determine how far down it is until the gum tissue attaches to the tooth. Ideally, we don’t like to see probing depths of more than 1-3 millimeters(mm). 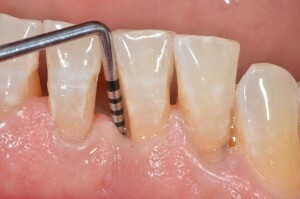 Any measurable depth means there is a gap between the gums and the teeth, which we refer to as a periodontal pocket. These pockets can trap food and bacteria causing inflammation, systemic infection, and tooth loss. Once the pockets reach 4-5mm or more, a regular cleaning is no longer appropriate to treat the condition. At this point, the bacteria has traveled deep enough under the gum line that the bone supporting the tooth is at risk. The standard treatment is a procedure called Scaling and Root Planing (SRP), also known as a “deep cleaning”. Scaling and Root Planing is performed by quadrant (the mouth is divided into four quadrants: upper left, lower left, upper right, lower right) and can be completed in one or more appointments. In order to successfully remove plaque and tartar from under the gum line, Dr. Jeremy Jorgenson will start by administering a local anesthetic to ensure that you are numb and comfortable during the cleaning. This is one reason why a patient may choose to only do 1-2 quadrants at a time, otherwise you will need to be prepared to be numb all over. The anesthetic will wear off within a few hours of leaving the office, but chewing food can put you at risk of biting your cheek or tongue. Next one of our caring and gentle hygienists will use a scaler to remove as much of the tartar, plaque, and bacteria that is possible. This will allow the infection to start to be contained so the gums can start adhering back to the tooth, preventing inflammation and bone loss. In most cases, Laser Bacterial Reduction and Oral Irrigation are highly recommended with Scaling and Root Planing to ensure that we zap those bacteria that we can’t reach with dental hand scalers! A prophylaxis or prophy or “regular cleaning” is a cleaning that is only appropriate for people with tight, health gums who only need a very shallow area of the gums cleaned . Once periodontal pockets measure 4-5mm, we must eliminate the bacteria in the gums using Scaling and Root Planing in order for the tissue to heal properly. If I need a deep cleaning now, will I always need deep cleanings? There are people who get one deep cleaning in their lives and never need it again. Patients who have great at home oral hygiene and keep up with their regular cleanings have more success, but there are patients that are just prone to accumulating bacteria that attacks the bone structure. This could be due to lack of flossing, age, stress, systemic disease or genetics. For these patients, more than one deep cleaning may need to be performed. Why do I need to come back in 3 months after a deep cleaning? My insurance only pays for a cleaning every 6 months. At Advanced Dental Care, we understand how frustrating it is that some insurances only cover one to two cleanings in a year, when more are required to maintain oral health. However, we believe our job is to provide you with honest and accurate diagnoses and to provide you with the treatment that is the best for your condition. If you had an infection in a finger, but your medical insurance stated they won’t cover treatment due to a previous infection, would you let your hand fall off? or worse? We do not let allow insurance companies or employer-negotiated dental plans to dictate what treatment you can receive. Your health is our top priority!